Radio Host Kevin Price, and Financial Coach Chris Kidd, who is a regular contributor and co-host on the Price of Business on Business Talk 1110 AM KTEK (on Bloomberg’s home in Houston), recently interviewed NBA great, Adonal Foyle. The Price of Business duo enjoyed having Foyle on so much the first time they invited him back for two more segments. Kevin and Chris spend most of the first interview talking with Adonal about his story. Foyle who grew up on the small Caribbean Island of Canouan. Most people would assume that a professional basketball player, like Foyle, had grown up playing basketball at a very young age and was just born with a natural talent for the game. This was not the case for Adonal, who did not even start playing basketball until the age of fifteen. Adonal Foyle was able to join Chris Kidd and Kevin Price about a week later to continue their conversation and dig deeper into the “Financial Fouls of Pro Athletes” and ways to avoid them. Chris asked Adonal when he started thinking about playing basketball at the pro level. For Foyle, the NBA was not even a thought early on. “I was terrible for the first few years of my career,” Foyle said. “For me, really getting an opportunity to go to college and getting an education was huge, because I was going to be the first person in my family to go on to college, so that was a really big deal for me.” Adonal credits his coach at Colgate University for helping him get to where he first started thinking about the NBA. His coach expanded their schedule to give them the opportunity to play against some big-time competition. By playing against the higher level competition, and after two appearances in the NCAA tournament, Adonal’s vision for his future expanded. After his Sophomore year Adonal got the call about making himself eligible for the NBA Draft. So after discussing it with his family he decided to leave college for the NBA. Foyle was selected, as the 8th overall pick, by the Golden State Warriors. While he was in the league, he managed to continue his undergraduate work at UC Berkley, and graduated from Colgate a few years later. While he was playing for the Orlando Magic, he was the director of player development, he began to see some big issues between players and finance. 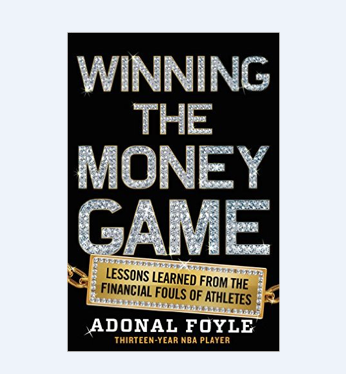 From the outside many of their financial issues looked obvious, but Foyle dug deeper and looked it from a sociological and psychological perspective. Foyle says, “Sometimes we miss the challenges that these guys have. If you’re an athlete and you come from an inner city or you come from a very negative background in terms of what you’ve been exposed to, and you have an entourage. If you just view the entourage as a negative thing, you miss what that entourage may mean to that player. That could be a person who gave them a pair of shoes that they needed when they were growing up, or a person that protected them.” He says that in some cases that person may mean more to them than their own family. Foyle continued, “I always thought of myself as a student first. I think sometimes there’s this machismo that we don’t know everything going into a situation and instead of trying to learn and really be a student of, we tend to kind of pretend that we know more than we do. So I have never been afraid to say I do not know what you’re talking about, you’ll have to explain it again.